A. 73 “Your hands have made me and formed me. wrongfully. I will meditate on Your precepts. b' 79 Let those who fear You return to me. They that know Your statutes. that I may not be disappointed." 119:73-75 The psalmist recognizes that the God who created him can give him the ability to understand why he was created (learn and do what God said). It's not cheating to ask God for help when studying His word. The fellowship of God-fearers rejoice over each other because they know that those who hope in God will experience the glory of God as He fulfills His promises to them. The fact that the psalmist is experiencing affliction and wrongful treatment from those that don't fear God, doesn't distress him, because he knows that God has allowed it in righteousness and faithfulness. 119:76-77 Because he delights in God's law and serves Him, he can look confidently to God being loyal to him (hesed) and showing compassion to him. This is not a blessing for those who don't live in covenantal loyalty to God. 119:78-80 In response to unjust treatment from the proud (yes, sometimes they win temporarily), the psalmist meditates upon God's word, for how he should respond. Those that know God's word will return to him (and comfort him). His desire is to be blameless both internally and externally with respect to God's law, so there is nothing that will hinder God aiding and vindicating him. Application: When it looks like the evil guys are winning, base your response on God's word and trust that He will gloriously deliver you because of His loyal hesed. Prayer: God, thanks for being righteous and faithful in all You do, including allowing me to experience affliction and injustice; may I be blameless in how I respond, so You can rescue me in Your hesed. Amen. Proverbs 28:1-5 Are You a Lion or a Lemming? Proverbs 28:1 “The wicked flee when no one pursues; but the righteous are as bold as a lion. 2 For rebellion/transgression, a land has many rulers, but order is maintained by a man of understanding and knowledge. 3 A needy man who oppresses the poor is like a driving rain which leaves no crops. 4 Those who forsake the law praise the wicked; but those who keep the law contend with them. 5 Evil men don't understand justice; but those who seek Yahweh understand it fully." Observations: 28:1 A clear conscience yields confidence. 28:2 God protects a nation which follows His ways, through wise leadership. 28:4-5 Those who have ingrained God's value system, understand justice and fight against the wicked who cause injustice. Love desires what's best for others. It is in the best interest of others to live in a just land. Application: If we know God and His ways, we will confidently contend against injustice. Prayer: Holy and Just God, show me how You want me to accomplish Your purposes in my corner of the universe. Amen. Mark 8-12 At the heart of Mark's Manual of Discipleship are two accounts of opening the eyes of two different blind men. The first is the only recorded two-stage miracle in history, with spitting and touching and questioning. The second is, done without a “healing word” or a touch, (just a “What do you want?” and a “Go your way, your faith has made you well.”). Maybe Jesus was getting better at this whole healing thing :) However the second healing concludes Jesus' main ministry to His disciples. Mark then records Jesus' triumphal entry into Jerusalem to die. So it should be obvious to anyone, except the exegetically blind, that the information enclosed between the bookends of the blind men is very significant. The confession of Jesus as the Messiah is found there, but that's only part of the story. The more significant information is what follows that confession, and immediately precedes the second healing. See the comments in chapters 8 and 10 for the answer to why it took Jesus two attempts to heal the first blind man. To give us more time in the epistles, we'll also look at the Palm Sunday entry into Jerusalem, since a lot of the material overlaps Matthew's account. Mark 8:1 "In those days, when there was a very great multitude, and they had nothing to eat, Jesus called his disciples to himself, and said to them, 2 "I have compassion on the multitude, because they have stayed with me now three days, and have nothing to eat. 3 If I send them away fasting to their home, they will faint on the way, for some of them have come a long way." 4 His disciples answered him, "From where could one satisfy these people with bread here in a deserted place?" 5 He asked them, "How many loaves do you have?" They said, "Seven." 6 He commanded the multitude to sit down on the ground, and he took the seven loaves. Having given thanks, he broke them, and gave them to his disciples to serve, and they served the multitude. 7 They had a few small fish. Having blessed them, he said to serve these also. 8 They ate, and were filled. They took up seven baskets of broken pieces that were left over. 9 Those who had eaten were about four thousand. Then he sent them away. 10 Immediately he entered into the boat with his disciples, and came into the region of Dalmanutha. 11 The Pharisees came out and began to question him, seeking from him a sign from heaven, and testing him. 12 He sighed deeply in his spirit, and said, "Why does this generation seek a sign? Most certainly I tell you, no sign will be given to this generation." 13 He left them, and again entering into the boat, departed to the other side. 14 They forgot to take bread; and they didn’t have more than one loaf in the boat with them. 15 He warned them, saying, "Take heed: beware of the yeast of the Pharisees and the yeast of Herod." 16 They reasoned with one another, saying, "It’s because we have no bread." 17 Jesus, perceiving it, said to them, "Why do you reason that it’s because you have no bread? Don’t you perceive yet, neither understand? Is your heart still hardened? 18 Having eyes, don’t you see? Having ears, don’t you hear? Don’t you remember? 19 When I broke the five loaves among the five thousand, how many baskets full of broken pieces did you take up?" They told him, "Twelve." 20 "When the seven loaves fed the four thousand, how many baskets full of broken pieces did you take up?" They told him, "Seven." 21 He asked them, "Don’t you understand, yet?" 22 He came to Bethsaida. They brought a blind man to him, and begged him to touch him. 23 He took hold of the blind man by the hand, and brought him out of the village. When he had spit on his eyes, and laid his hands on him, he asked him if he saw anything. 24 He looked up, and said, "I see men; for I see them like trees walking." 25 Then again he laid his hands on his eyes. He looked intently, and was restored, and saw everyone clearly. 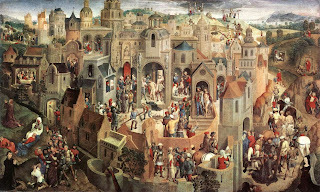 26 He sent him away to his house, saying, "Don’t enter into the village, nor tell anyone in the village." 27 Jesus went out, with his disciples, into the villages of Caesarea Philippi. On the way he asked his disciples, "Who do men say that I am?" 28 They told him, "John the Baptizer, and others say Elijah, but others: one of the prophets." 29 He said to them, "But who do you say that I am?" Peter answered, "You are the Christ." 30 He commanded them that they should tell no one about him. 31 He began to teach them that the Son of Man must suffer many things, and be rejected by the elders, the chief priests, and the scribes, and be killed, and after three days rise again. 32 He spoke to them openly. Peter took him, and began to rebuke him. 33 But he, turning around, and seeing his disciples, rebuked Peter, and said, "Get behind me, Satan! For you have in mind not the things of God, but the things of men." 34 He called the multitude to himself with his disciples, and said to them, "Whoever wants/desires to come after me, let him deny himself, and take up his cross, and follow me. 35 For whoever wants to save his life will lose it; and whoever will lose his life for my sake and the sake of the Good News will save it. 36 For what does it profit a man, to gain the whole world, and forfeit his life? 37 For what will a man give in exchange for his life? 38 For whoever will be ashamed of me and of my words in this adulterous and sinful generation, the Son of Man also will be ashamed of him, when he comes in the glory of his Father with the holy angels." Observations: 8:1-21 The feeding of the four thousand, the Pharisees seeking a sign, and the warning about the leaven of the Pharisees is similar to Matthew's account in Matthew 15:32-16:12. It differs in not identifying the leaven as false teaching, but giving an elaboration of the hardness of heart (introduced in Mark 3:5 in reference to the Pharisees and in Mark 6:52 in reference to the disciples). When faced with a sign/miracle which indicated that Jesus was the Messiah, the Pharisees refused to rearrange their tradition based paradigm to incorporate the new facts/truth in front of their eyes. Holiness was a matter of internals, not externals. The disciples needed to rearrange their understanding to accommodate the truth that when following Jesus, He would meet their needs, and the normal rules/paradigm of getting bread didn't apply. Don't misapply this to be irresponsible on the job, or in school, or in life; one must be responding in precision obedience to God's precise will for this principle to work. Protection, provision, daily bread, (and promotion) are not a matter of their external efforts (except as an expression of one's inner compulsion to obediently please God) but rather a result of God guiding and blessing the resolve of a disciple's heart (Daniel 1:8). 8:22-26 I've included a fuller exposition of the structure and content under Digging Deeper. For now, note that the man is brought almost passively to Jesus (contrast this with Blind Bart in 10:47). 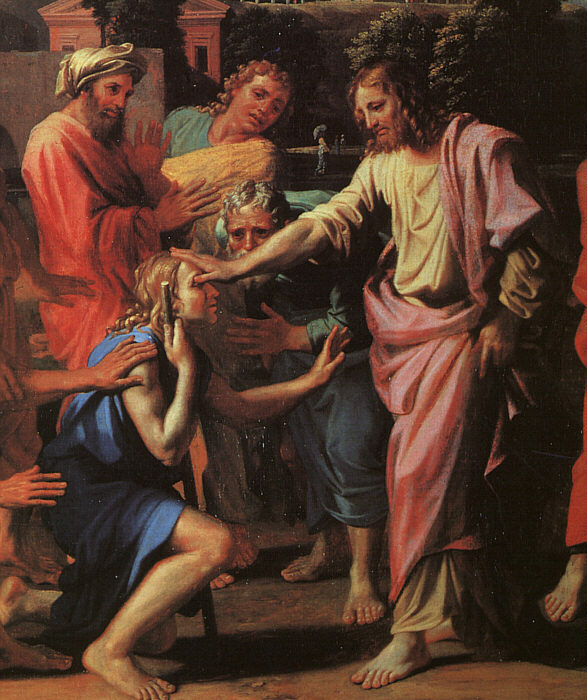 Jesus spits and touches His eyes, perhaps indicating that the healing is coming from His word. The first touch of Jesus gives the man partial vision, seeing, but not clearly. The second touch gives him 20/20. The same thing occurs with the disciples, they see partially, but don't have the full picture. This would also be true of most believers today. The are convinced that Jesus is the Messiah, but don't have the full picture. 8:27-33 Jesus asks His disciples, whom people, and they, think He is. Like the blind man in stage one, Peter confesses that He is the Christ. This is equivalent to seeing people as walking trees. Verse 31 begins the “second touch” which the disciples (and most people) were missing. Peter's rebuke of Jesus indicates how true this is (see comments on Matthew 16:13-28). 8:34-38 The call to discipleship has five elements. You can hear an exposition of these “steps” in Daniel the Disciple-Maker on Truthbase.net. A. Desire God: Purpose/Resolve/Determine that following God is a more worthy purpose for life than fishing (Mark 1:17). It's your choice. C. Daily Death/carry cross: Humans consist of body (soma), soul (psuche), and spirit (pneuma). The soul (translated life) consists of our mind/will/emotions. A cross-carrier was on his way to (deserved) death, not caring for the pleasures or praises of the world. E. Delight: in blessing/reward is sharing in the glory and reign of the Messiah. Hear: “Well done, good and faithful servant...enter into the joy” or experience the despair of the unprofitable servant. Application: At what point did you move from Curious about Jesus to Convinced that He is the Messiah and Savior? When did you move from being Convinced to being Committed to follow regardless of the cost? See Survey of Discipleship for elaboration. Prayer: My Savior and Lord, You are totally worthy of my life, and all that it consists of; I will follow You; please guide me in doing it in a manner that pleases You. Amen. Mark 9:1 He said to them, "Most certainly I tell you, there are some standing here who will in no way taste death until they see the Kingdom of God come/appear with power." 2 After six days Jesus took with him Peter, James, and John, and brought them up onto a high mountain privately by themselves, and he was changed into another form in front of them. 3 His clothing became glistening, exceedingly white, like snow, such as no launderer on earth can whiten them. 4 Elijah and Moses appeared to them, and they were talking with Jesus. 5 Peter answered Jesus, "Rabbi, it is good for us to be here. Let’s make three tents: one for you, one for Moses, and one for Elijah." 6 For he didn’t know what to say, for they were very afraid. 7 A cloud came, overshadowing them, and a voice came out of the cloud, "This is my beloved Son. Listen to him." 8 Suddenly looking around, they saw no one with them any more, except Jesus only. 9 As they were coming down from the mountain, he commanded them that they should tell no one what things they had seen, until after the Son of Man had risen from the dead. 10 They kept this saying to themselves, questioning what the "rising from the dead" meant. 11 They asked him, saying, "Why do the scribes say that Elijah must come first?" 12 He said to them, "Elijah indeed comes first, and restores all things. How is it written about the Son of Man, that he should suffer many things and be despised? 13 But I tell you that Elijah has come, and they have also done to him whatever they wanted to, even as it is written about him." 14 Coming to the disciples, he saw a great multitude around them, and scribes questioning them. 15 Immediately all the multitude, when they saw him, were greatly amazed, and running to him greeted him. 16 He asked the scribes, "What are you asking them?" 17 One of the multitude answered, "Teacher, I brought to you my son, who has a mute spirit; 18 and wherever it seizes him, it throws him down, and he foams at the mouth, and grinds his teeth, and wastes away. I asked your disciples to cast it out, and they weren’t able." 19 He answered him, "Unbelieving generation, how long shall I be with you? How long shall I bear with you? Bring him to me." 20 They brought him to him, and when he saw him, immediately the spirit convulsed him, and he fell on the ground, wallowing and foaming at the mouth. 21 He asked his father, "How long has it been since this has come to him?" He said, "From childhood. 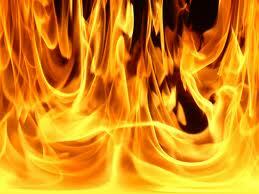 22 Often it has cast him both into the fire and into the water, to destroy him. But if you can do anything, have compassion on us, and help us." 23 Jesus said to him, "If you can believe, all things are possible to him who believes." 24 Immediately the father of the child cried out with tears, "I believe. Help my unbelief!" 25 When Jesus saw that a multitude came running together, he rebuked the unclean spirit, saying to him, "You mute and deaf spirit, I command you, come out of him, and never enter him again!" 26 Having cried out, and convulsed greatly, it came out of him. The boy became like one dead; so much that most of them said, "He is dead." 27 But Jesus took him by the hand, and raised him up; and he arose. 28 When he had come into the house, his disciples asked him privately, "Why couldn’t we cast it out?" 29 He said to them, "This kind can come out by nothing, except by prayer and fasting." 30 They went out from there, and passed through Galilee. He didn’t want anyone to know it. 31 For he was teaching his disciples, and said to them, "The Son of Man is being handed over to the hands of men, and they will kill him; and when he is killed, on the third day he will rise again." 32 But they didn’t understand the saying, and were afraid to ask him. 33 He came to Capernaum, and when he was in the house he asked them, "What were you arguing among yourselves on the way?" 34 But they were silent, for they had disputed one with another on the way about who was the greatest. 35 He sat down, and called the twelve; and he said to them, "If any man wants to be first, he shall be last of all, and servant of all." 36 He took a little child, and set him in their midst. Taking him in his arms, he said to them, 37 "Whoever receives one such little child in my name, receives me, and whoever receives me, doesn’t receive me, but him who sent me." 38 John said to him, "Teacher, we saw someone who doesn’t follow us casting out demons in your name; and we forbade him, because he doesn’t follow us." 39 But Jesus said, "Don’t forbid him, for there is no one who will do a mighty work in my name, and be able quickly to speak evil of me. 40 For whoever is not against us is on our side. 41 For whoever will give you a cup of water to drink in my name, because you are Christ’s, most certainly I tell you, he will in no way lose his reward. 42 Whoever will cause one of these little ones who believe in me to stumble, it would be better for him if he were thrown into the sea with a millstone hung around his neck. 43 If your hand causes you to stumble, cut it off. It is better for you to enter into life maimed, rather than having your two hands to go into Gehenna, into the unquenchable fire, 44 ’where their worm doesn’t die, and the fire is not quenched.’ 45 If your foot causes you to stumble, cut it off. It is better for you to enter into life lame, rather than having your two feet to be cast into Gehenna, into the fire that will never be quenched— 46 ’where their worm doesn’t die, and the fire is not quenched.’ 47 If your eye causes you to stumble, cast it out. It is better for you to enter into the Kingdom of God with one eye, rather than having two eyes to be cast into the Gehenna of fire, 48 ’where their worm doesn’t die, and the fire is not quenched.’ 49 For everyone will be salted with fire, and every sacrifice will be seasoned with salt. 50 Salt is good, but if the salt has lost its saltiness, with what will you season it? Have salt in yourselves, and be at peace with one another." Observations: 9:1-14 Jesus validated His teaching about coming in glory with a promise of seeing the Kingdom of God, which was fulfilled in the appearing of His glory on the Mount of Transfiguration. See Mt 17 for comments. 9:15-29 Mark gives the most detail of the demon the disciples weren't able to cast out, perhaps to stress the need for dependence and faith. See comments on Mt 17. 9:30-48 The twelve disciples at this point could be called the dozen dummies, because they can't rearrange their paradigm to understand the betrayal, death, and resurrection of Jesus. Then they commit the “unpardonable sin” of disciples, they were afraid to ask about what they didn't understand, remaining in their ignorance. Instead of gaining wisdom and insight, they were arguing with each other about who was going to be greatest in the kingdom. Jesus doesn't say there is no hierarchy, but tells them how to be great. Something about servanthood. If you don't get it, don't worry, the disciples didn't either, but we have another chapter in which to get it. The content parallels Mt 18 (q.v. = which see), except for the free-lance fiend caster, and the salty fire. Luke 9:49-50 also mentions the guy who was casting out demons in Jesus' name. The disciples got all huffy and told him to stop, but Jesus said anyone who was not against them is with them, especially if they cast out demons in His name. They wouldn't be speaking against Him in the next breath (like those evil Pharisees). The teaching regarding sacrificing anything that would hinder one's participation/reward in the Kingdom (see also Mt 5:29-30; 18:6-9), and result in works being burned up in the garbage dump of Gehenna (1Cor 3:15), leads to the subject of undergoing the trial of fire. 9:49-50 The salty fire comment is unique to Mark, whose audience would be facing fiery trials at the hands of Nero. Christians in Rome were ordered to burn a pinch of incense to the image of the Emperor or become cat food in the Coliseum, or impaled on a stake and lit like candles. (This was common practice until AD 325.) Leviticus 2:13, the Mosaic service, and Ezekiel 43:24, the Millennial service, both required all sacrifices to be be accompanied with salt, a symbol of faithful endurance (as in a covenant of salt). Jesus is warning the disciples that all who follow Him will suffer a refining and sometimes sacrificial fire, the sacrifice of themselves must be accompanied by enduring loyalty to Him. Failure to remain loyal results in diminished worth and reward. See comments on Mt 5:13 for verse 50 and the secret of unshakable self-worth. Remember the essential characteristic of a disciple is a desire to deny oneself to follow Jesus, thus He admonished them to use that characteristic to live in peace with each other. Application: Being disciple, a reward worthy servant, and living in peaceful harmony with others requires self-denial. It will be worth it (you're going to lose it anyway -see Jim Elliott quote). Prayer: Lord, may I follow Your example in denying myself for the benefit of others, and the glory of Your kingdom. Show me where my paradigm is stuck on my pride. Amen. 10:1 He arose from there and came into the borders of Judea and beyond the Jordan. Multitudes came together to him again. As he usually did, he was again teaching them. 2 Pharisees came to him testing him, and asked him, "Is it lawful for a man to divorce his wife?" 3 He answered, "What did Moses command you?" 4 They said, "Moses allowed a certificate of divorce to be written, and to divorce her." 5 But Jesus said to them, "For your hardness of heart, he wrote you this commandment. 6 But from the beginning of the creation, God made them male and female. 7 For this cause a man will leave his father and mother, and will join to his wife, 8 and the two will become one flesh, so that they are no longer two, but one flesh. 9 What therefore God has joined together, let no man separate." 10 In the house, his disciples asked him again about the same matter. 11 He said to them, "Whoever divorces his wife, and marries another, commits adultery against her. 12 If a woman herself divorces her husband, and marries another, she commits adultery." 13 They were bringing to him little children, that he should touch them, but the disciples rebuked those who were bringing them. 14 But when Jesus saw it, he was moved with indignation, and said to them, "Allow the little children to come to me! Don’t forbid them, for the Kingdom of God belongs to such as these. 15 Most certainly I tell you, whoever will not receive the Kingdom of God like a little child, he will in no way enter into it." 16 He took them in his arms, and blessed them, laying his hands on them. 17 As he was going out into the way, one ran to him, knelt before him, and asked him, "Good Teacher, what shall I do that I may inherit eternal life?" 18 Jesus said to him, "Why do you call me good? No one is good except one—God. 19 You know the commandments: ‘Do not murder,’ ‘Do not commit adultery,’ ‘Do not steal,’ ‘Do not give false testimony,’ ‘Do not defraud,’ ‘Honor your father and mother.’" 20 He said to him, "Teacher, I have observed all these things from my youth." 21 Jesus looking at him loved him, and said to him, "One thing you lack. Go, sell whatever you have, and give to the poor, and you will have treasure in heaven; and come, follow me, taking up the cross." 22 But his face fell at that saying, and he went away sorrowful, for he was one who had great possessions. 23 Jesus looked around, and said to his disciples, "How difficult it is for those who have riches to enter into the Kingdom of God!" 24 The disciples were amazed at his words. But Jesus answered again, "Children, how hard is it for those who trust in riches to enter into the Kingdom of God! 25 It is easier for a camel to go through a needle’s eye than for a rich man to enter into the Kingdom of God." 26 They were exceedingly astonished, saying to him, "Then who can be saved?" 27 Jesus, looking at them, said, "With men it is impossible, but not with God, for all things are possible with God." 28 Peter began to tell him, "Behold, we have left all, and have followed you." 29 Jesus said, "Most certainly I tell you, there is no one who has left house, or brothers, or sisters, or father, or mother, or wife, or children, or land, for my sake, and for the sake of the Good News, 30 but he will receive one hundred times more now in this time, houses, brothers, sisters, mothers, children, and land, with persecutions; and in the age to come eternal life. 31 But many who are first will be last; and the last first." 32 They were on the way, going up to Jerusalem; and Jesus was going in front of them, and they were amazed; and those who followed were afraid. He again took the twelve, and began to tell them the things that were going to happen to him. 33 "Behold, we are going up to Jerusalem. The Son of Man will be delivered to the chief priests and the scribes. They will condemn him to death, and will deliver him to the Gentiles. 34 They will mock him, spit on him, scourge him, and kill him. On the third day he will rise again." 35 James and John, the sons of Zebedee, came near to him, saying, "Teacher, we want you to do for us whatever we will ask." 36 He said to them, "What do you want me to do for you?" 37 They said to him, "Grant to us that we may sit, one at your right hand, and one at your left hand, in your glory." 38 But Jesus said to them, "You don’t know what you are asking. Are you able to drink the cup that I drink, and to be baptized with the baptism that I am baptized with?" 39 They said to him, "We are able." Jesus said to them, "You shall indeed drink the cup that I drink, and you shall be baptized with the baptism that I am baptized with; 40 but to sit at my right hand and at my left hand is not mine to give, but for whom it has been prepared." 41 When the ten heard it, they began to be indignant towards James and John. 42 Jesus summoned them, and said to them, "You know that they who are recognized as rulers over the nations lord it over them, and their great ones exercise authority over them. 43 But it shall not be so among you, but whoever wants to become great among you shall be your servant. 44 Whoever of you wants to become first among you, shall be bondservant of all. 45 For the Son of Man also came not to be served, but to serve, and to give his life as a ransom for many." 46 They came to Jericho. As he went out from Jericho, with his disciples and a great multitude, the son of Timaeus, Bartimaeus, a blind beggar, was sitting by the road. 47 When he heard that it was Jesus the Nazarene, he began to cry out, and say, "Jesus, you son of David, have mercy on me!" 48 Many rebuked him, that he should be quiet, but he cried out much more, "You son of David, have mercy on me!" 49 Jesus stood still, and said, "Call him." They called the blind man, saying to him, "Cheer up! Get up. He is calling you!" 50 He, casting away his cloak, sprang up, and came to Jesus. 51 Jesus asked him, "What do you want me to do for you?" The blind man said to him, "Rabboni, that I may see again." 52 Jesus said to him, "Go your way. Your faith has made you well." Immediately he received his sight, and followed Jesus in the way. Observations: 10:1-12 See Matthew 19 for comments on divorce and those whom God has joined together, as well as for comments in the following section. 10:13-31 See Matthew 19 and Digging Deeper for elaboration of the rich young ruler. These are verses about reward in heaven, not the forgiveness of sins. Note that one doesn't leave their husband to follow Jesus, nor does one get additional wives in this life. 10:32-45 This is the climax of the book. Jesus again foretells His suffering and death, and the disciples ignore it to angle for positions of power and glory. Brothers James and John, who were with Peter on the Mount of Transfiguration, witnessing His glory, try to block out Peter of the best seats. See comments on parallel section in Mt 20. Jesus gives them the sole secret of greatness: If you want to be great, be a servant of the real needs of others. If you want to be greater, serve more; if you want to be the greatest, serve the most. Then in verse 45, He gives the final word on the subject: the Son of Man (the one Daniel 7:13-14 said is given all glory) came not to be served, but to give His life as a ransom for others. The route to glory was along the road of suffering, sacrificial service. There are no short-cuts. If the Son of Man, the Lord of Glory (1Cor 2:6), the Captain of our Salvation (Hebrews 2:10) was brought to perfection/completion and glory through sufferings, why do we think we can take the broad easy way? This is what the disciples couldn't see. They could see that He was the Messiah, but they didn't see that the route to glory was sacrificial service. They would. 10:46-52 Next Jesus, the Son of David, responds to Blind Bart's begging faith, with granting His request and opening His eyes. No multiple stages, nor spitting and touching, not even a magic healing word. Just a grant of a loyal subject's request by the Sovereign of Salvation. 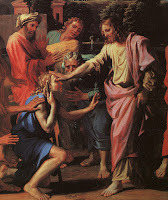 Bart used His sight to follow as Jesus' disciple. In the next verses Mark moves Jesus into Jerusalem on Psalm Sunday. The private instruction of the disciples in Galilee had drawn to a close, and now Jesus moved to the next phase of the Father's plan: be rejected and resurrected, rescuing humanity from everlasting death in the process. Application: If you want to be great in God's kingdom (and you should, since it's a very Christlike thing to do -see How to Glorify God in TOYL), you must deny yourself and serve the real needs of others. It will be totally worth it. Prayer: Heavenly Father, may I draw upon Your grace every day to follow in my Master's steps in serving others; please open my eyes to their needs, and any log jams of self that prevent me from being used by You in their lives. Thanks for Your empowerment, and promise of glory. Amen. 11:1 When they drew near to Jerusalem, to Bethsphage and Bethany, at the Mount of Olives, he sent two of his disciples, 2 and said to them, "Go your way into the village that is opposite you. Immediately as you enter into it, you will find a young donkey tied, on which no one has sat. Untie him, and bring him. 3 If anyone asks you, ‘Why are you doing this?’ say, ‘The Lord needs him’; and immediately he will send him back here." 4 They went away, and found a young donkey tied at the door outside in the open street, and they untied him. 5 Some of those who stood there asked them, "What are you doing, untying the young donkey?" 6 They said to them just as Jesus had said, and they let them go. 7 They brought the young donkey to Jesus, and threw their garments on it, and Jesus sat on it. 8 Many spread their garments on the way, and others were cutting down branches from the trees, and spreading them on the road. 9 Those who went in front, and those who followed, cried out, "Hosanna! Blessed is he who comes in the name of the Lord! 10 Blessed is the kingdom of our father David that is coming in the name of the Lord! Hosanna in the highest!" 11 Jesus entered into the temple in Jerusalem. When he had looked around at everything, it being now evening, he went out to Bethany with the twelve. 12 The next day, when they had come out from Bethany, he was hungry. 13 Seeing a fig tree afar off having leaves, he came to see if perhaps he might find anything on it. When he came to it, he found nothing but leaves, for it was not the season for figs. 14 Jesus told it, "May no one ever eat fruit from you again!" and his disciples heard it. 15 They came to Jerusalem, and Jesus entered into the temple, and began to throw out those who sold and those who bought in the temple, and overthrew the tables of the money changers, and the seats of those who sold the doves. 16 He would not allow anyone to carry a container through the temple. 17 He taught, saying to them, "Isn’t it written, ‘My house will be called a house of prayer for all the nations?’ But you have made it a den of robbers!" 18 The chief priests and the scribes heard it, and sought how they might destroy him. For they feared him, because all the multitude was astonished at his teaching. 19 When evening came, he went out of the city. 20 As they passed by in the morning, they saw the fig tree withered away from the roots. 21 Peter, remembering, said to him, "Rabbi, look! The fig tree which you cursed has withered away." 22 Jesus answered them, "Have faith in God. 23 For most certainly I tell you, whoever may tell this mountain, ‘Be taken up and cast into the sea,’ and doesn’t doubt in his heart, but believes that what he says is happening; he shall have whatever he says. 24 Therefore I tell you, all things whatever you pray and ask for, believe that you have received them, and you shall have them. 25 Whenever you stand praying, forgive, if you have anything against anyone; so that your Father, who is in heaven, may also forgive you your transgressions. 26 But if you do not forgive, neither will your Father in heaven forgive your transgressions." 27 They came again to Jerusalem, and as he was walking in the temple, the chief priests, and the scribes, and the elders came to him, 28 and they began saying to him, "By what authority do you do these things? Or who gave you this authority to do these things?" 29 Jesus said to them, "I will ask you one question. Answer me, and I will tell you by what authority I do these things. 30 The baptism of John—was it from heaven, or from men? Answer me." 31 They reasoned with themselves, saying, "If we should say, ‘From heaven’; he will say, ‘Why then did you not believe him?’ 32 If we should say, ‘From men’"—they feared the people, for all held John to really be a prophet. 33 They answered Jesus, "We don’t know." Jesus said to them, "Neither do I tell you by what authority I do these things." Observations: 11:1-33 This chapter parallels Matthew 21 pretty closely, so see comments there if you missed them. One little difference is in the recognition of the cursing/withering of the fig tree. Matthew said it withered immediately, which it did, but Mark said the disciples didn't see it until the next day, which they did. The rejection of Jesus in the temple made it official, there would be no fruit from this generation as a nation (obviously the disciples were fruit as were those who accepted Him in Acts). The cursing of the fig tree symbolized God's rejection of the nation, until they repent (see Romans 11). Mark also includes some of Jesus' teaching on prayer and forgiveness, that parallels what Matthew recorded in the Sermon on the Mount. Maybe Peter and the other disciples were still annoyed with what James and John tried to do last chapter. Application: A good relationship with God depends upon good relationships with others. Prayer: Father, thanks that You have forgiven me all my offenses on the basis of Christ's death on my behalf; I will forgive others as graciously as You have forgiven me. Amen. 12:1 He began to speak to them in parables. "A man planted a vineyard, put a hedge around it, dug a pit for the winepress, built a tower, rented it out to a farmer, and went into another country. 2 When it was time, he sent a servant to the farmer to get from the farmer his share of the fruit of the vineyard. 3 They took him, beat him, and sent him away empty. 4 Again, he sent another servant to them; and they threw stones at him, wounded him in the head, and sent him away shamefully treated. 5 Again he sent another; and they killed him; and many others, beating some, and killing some. 6 Therefore still having one, his beloved son, he sent him last to them, saying, ‘They will respect my son.’ 7 But those farmers said among themselves, ‘This is the heir. Come, let’s kill him, and the inheritance will be ours.’ 8 They took him, killed him, and cast him out of the vineyard. 9 What therefore will the lord of the vineyard do? He will come and destroy the farmers, and will give the vineyard to others. 10 Haven’t you even read this Scripture: ‘The stone which the builders rejected, the same was made the head of the corner. 11 This was from the Lord, it is marvelous in our eyes’?" 12 They tried to seize him, but they feared the multitude; for they perceived that he spoke the parable against them. They left him, and went away. 13 They sent some of the Pharisees and of the Herodians to him, that they might trap him with words. 14 When they had come, they asked him, "Teacher, we know that you are honest, and don’t defer to anyone; for you aren’t partial to anyone, but truly teach the way of God. Is it lawful to pay taxes to Caesar, or not? 15 Shall we give, or shall we not give?" But he, knowing their hypocrisy, said to them, "Why do you test me? Bring me a denarius, that I may see it." 16 They brought it. He said to them, "Whose is this image and inscription?" They said to him, "Caesar’s." 17 Jesus answered them, "Render to Caesar the things that are Caesar’s, and to God the things that are God’s." They marveled greatly at him. 18 There came to him Sadducees, who say that there is no resurrection. They asked him, saying, 19 "Teacher, Moses wrote to us, ‘If a man’s brother dies, and leaves a wife behind him, and leaves no children, that his brother should take his wife, and raise up offspring for his brother.’ 20 There were seven brothers. The first took a wife, and dying left no offspring. 21 The second took her, and died, leaving no children behind him. The third likewise; 22 and the seven took her and left no children. Last of all the woman also died. 23 In the resurrection, when they rise, whose wife will she be of them? For the seven had her as a wife." 24 Jesus answered them, "Isn’t this because you are mistaken, not knowing the Scriptures, nor the power of God? 25 For when they will rise from the dead, they neither marry, nor are given in marriage, but are like angels in heaven. 26 But about the dead, that they are raised; haven’t you read in the book of Moses, about the Bush, how God spoke to him, saying, ‘I am the God of Abraham, the God of Isaac, and the God of Jacob’? 27 He is not the God of the dead, but of the living. You are therefore badly mistaken." 28 One of the scribes came, and heard them questioning together. Knowing that he had answered them well, asked him, "Which commandment is the greatest of all?" 29 Jesus answered, "The greatest is, ‘Hear, Israel, the Lord our God, the Lord is one: 30 you shall love the Lord your God with all your heart, and with all your soul, and with all your mind, and with all your strength.’ This is the first commandment. 31 The second is like this, ‘You shall love your neighbor as yourself.’ There is no other commandment greater than these." 32 The scribe said to him, "Truly, teacher, you have said well that he is one, and there is none other but he, 33 and to love him with all the heart, and with all the understanding, with all the soul, and with all the strength, and to love his neighbor as himself, is more important than all whole burnt offerings and sacrifices." 34 When Jesus saw that he answered wisely, he said to him, "You are not far from the Kingdom of God." No one dared ask him any question after that. 35 Jesus responded, as he taught in the temple, "How is it that the scribes say that the Christ is the son of David? 36 For David himself said in the Holy Spirit, ‘The Lord said to my Lord, "Sit at my right hand, until I make your enemies the footstool of your feet. "’ 37 Therefore David himself calls him Lord, so how can he be his son?" The common people heard him gladly. 38 In his teaching he said to them, "Beware of the scribes, who like to walk in long robes, and to get greetings in the marketplaces, 39 and the best seats in the synagogues, and the best places at feasts: 40 those who devour widows’ houses, and for a pretense make long prayers. These will receive greater condemnation." 41 Jesus sat down opposite the treasury, and saw how the multitude cast money into the treasury. Many who were rich cast in much. 42 A poor widow came, and she cast in two small brass coins, which equal a quadrans coin. 43 He called his disciples to himself, and said to them, "Most certainly I tell you, this poor widow gave more than all those who are giving into the treasury, 44 for they all gave out of their abundance, but she, out of her poverty, gave all that she had to live on." Observations: 12:1-37 Mark records the same parables Matthew does in chapter 21 so please see comments there. The dialogue and debates match those in Matthew 22. Mark has the most extended record of the conversation regarding the two greatest commandments compared to the other gospel writers. 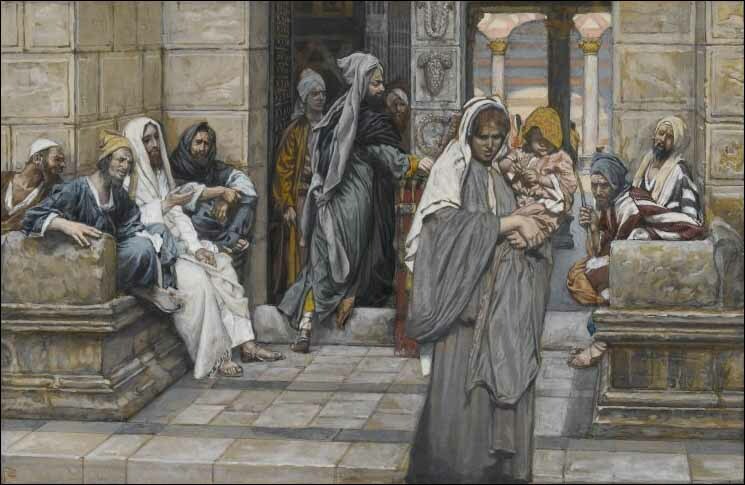 The account of the widow (below) is not in Matthew, and contrast nicely with those in the beginning of the chapter who don't give God His due. 12:38-44 Jesus warns of the hypocritical scribes (teachers of the law) who do things to be seen by men, and will receive a greater condemnation as a result. This indicates that there are degrees of God's displeasure, usually corresponding to stewardship and faithfulness. Since the scribes knew the law better than others, they should have been more exemplary in their application and conduct. Instead it is a widow that demonstrates the correct response (worship) to God. She gives more than all others, since she gave all she had, trusting God to meet her need for daily bread. It's not the amount, but the heart that God uses as the basis of evaluation (2Cor 8:1-7). Application: What do you owe God in terms of time, money, love, service, and strength? Are you giving Him your all, to the extent that you have to trust Him for everything, or only giving what is convenient and comfortable? Prayer: Lord God, You are worth of my all; show me where I may be holding back, and pry my grabby little fingers off that which I will despise when I see things from Your perspective. Amen. significant segment of the Book, occurring between two accounts of Jesus opening the eyes of the blind. In the first, Jesus does a two stage healing: the man saw in part, and then saw in whole. This parallels what was going on with the disciples. Immediately after the two-stage eye-opening the disciples saw that Jesus was the Messiah. (Stage 1') However, they did not understand that the route to glory was self-sacrificial serving. (Stage 2') Which is why Jesus begins to immediately instruct them in His (and their) upcoming sacrificial service. Between the two-stage miracle and eye-opening of Bartimaeus (10:46) Jesus is instructing the disciples that he and they must suffer for glory. It is in the middle of this section that the rich young man comes to Jesus. The prominence and amount of space given to this account in a major reward section precludes any reading of justification-forgiveness into the narrative, unless demanded by the dialogue. As can be clearly seen, the dialogue centers around reward, not forgiveness. Mk 8:23 He took the blind man by the hand and led him outside the village. When he had spit on the man's eyes and put his hands on him, Jesus asked, "Do you see anything?" 24 He looked up and said, "I see people; they look like trees walking around." STAGE 1' - Eyes partially opened = Jesus is the Messiah; but disciples don't clearly see the route to His rulership. asked them, "Who do people say I am?" 28 They replied, "Some say John the Baptist; others say Elijah; and still others, one of the prophets." 29 "But what about you?" he asked. " Who do you say I am?" Peter answered, "You are the Christ. " STAGE 2' begins - Jesus begins to instruct that the route to rulership is self-sacrificial service. This section follows the pattern discussed above in Matthew (in the Study Guide). Notice that get=inherit; Jesus specifically states that there is only ONE thing the person lacks, and that is not stated as trust in Christ's death on his behalf, but rather self-sacrificial works. times as much in this present age (homes, brothers, sisters, mothers, children and fields and with them, persecutions) and in the age to come, eternal life. 31 But many who are first will be last, and the last first." servant, 44 and whoever wants to be first must be slave of all. 45 For even the Son of Man did not come to be served, but to serve, and to give his life as a ransom for many. "46 Then they came to Jericho. As Jesus and his disciples, together with a large crowd, were leaving the city, a blind man, Bartimaeus (that is, the Son of Timaeus), was sitting by the roadside begging.... 52 "Go," said Jesus, "your faith has healed you." Immediately he received his sight and followed Jesus along the road. sacrificial service, as must the disciples. whoever wants to become great among you must be your servant, 27 and whoever wants to be first must be your slave 28 just as the Son of Man did not come to be served, but to serve, and to give his life as a ransom for many." God in a nutshell: The Father gives glory and dominion over the world to the Son who sacrifices Himself to ransom and redeem people to share in His goodness. Build-a-Jesus: The Son of Man enters His glory through the route of sacrificial service of others, in submission to the Father's will. Us in a nutshell: If we want to follow Jesus to glory, we must take the same route He took. 8:1 In those days, when there was a very great multitude, and they had nothing to eat, Jesus called his disciples to himself, and said to them, 2 "I have compassion on the multitude, because they have stayed with me now three days, and have nothing to eat. 3 If I send them away fasting to their home, they will faint on the way, for some of them have come a long way." 4 His disciples answered him, "From where could one satisfy these people with bread here in a deserted place?" 5 He asked them, "How many loaves do you have?" They said, "Seven." 6 He commanded the multitude to sit down on the ground, and he took the seven loaves. Having given thanks, he broke them, and gave them to his disciples to serve, and they served the multitude. 7 They had a few small fish. Having blessed them, he said to serve these also. 8 They ate, and were filled. They took up seven baskets of broken pieces that were left over. 9 Those who had eaten were about four thousand. Then he sent them away. 27 Jesus went out, with his disciples, into the villages of Caesarea Philippi. On the way he asked his disciples, "Who do men say that I am?" 28 They told him, "John the Baptizer, and others say Elijah, but others: one of the prophets." 29 He said to them, "But who do you say that I am?" Peter answered, "You are the Christ." 30 He commanded them that they should tell no one about him. 31 He began to teach them that the Son of Man must suffer many things, and be rejected by the elders, the chief priests, and the scribes, and be killed, and after three days rise again. 32 He spoke to them openly. Peter took him, and began to rebuke him. 33 But he, turning around, and seeing his disciples, rebuked Peter, and said, "Get behind me, Satan! For you have in mind not the things of God, but the things of men." 34 He called the multitude to himself with his disciples, and said to them, "Whoever wants to come after me, let him deny himself, and take up his cross, and follow me. 35 For whoever wants to save his life will lose it; and whoever will lose his life for my sake and the sake of the Good News will save it. 36 For what does it profit a man, to gain the whole world, and forfeit his life? 37 For what will a man give in exchange for his life? 38 For whoever will be ashamed of me and of my words in this adulterous and sinful generation, the Son of Man also will be ashamed of him, when he comes in the glory of his Father with the holy angels." 9:1 He said to them, "Most certainly I tell you, there are some standing here who will in no way taste death until they see the Kingdom of God come with power." 2 After six days Jesus took with him Peter, James, and John, and brought them up onto a high mountain privately by themselves, and he was changed into another form in front of them. 3 His clothing became glistening, exceedingly white, like snow, such as no launderer on earth can whiten them. 4 Elijah and Moses appeared to them, and they were talking with Jesus. 5 Peter answered Jesus, "Rabbi, it is good for us to be here. Let’s make three tents: one for you, one for Moses, and one for Elijah." 6 For he didn’t know what to say, for they were very afraid. 7 A cloud came, overshadowing them, and a voice came out of the cloud, "This is my beloved Son. Listen to him." 8 Suddenly looking around, they saw no one with them any more, except Jesus only. 9 As they were coming down from the mountain, he commanded them that they should tell no one what things they had seen, until after the Son of Man had risen from the dead. 10 They kept this saying to themselves, questioning what the "rising from the dead" meant. 11 They asked him, saying, "Why do the scribes say that Elijah must come first?" 12 He said to them, "Elijah indeed comes first, and restores all things. How is it written about the Son of Man, that he should suffer many things and be despised? 13 But I tell you that Elijah has come, and they have also done to him whatever they wanted to, even as it is written about him." 17 As he was going out into the way, one ran to him, knelt before him, and asked him, "Good Teacher, what shall I do that I may inherit eternal life?" 18 Jesus said to him, "Why do you call me good? No one is good except one—God. 19 You know the commandments: ‘Do not murder,’ ‘Do not commit adultery,’ ‘Do not steal,’ ‘Do not give false testimony,’ ‘Do not defraud,’ ‘Honour your father and mother.’" 20 He said to him, "Teacher, I have observed all these things from my youth." 21 Jesus looking at him loved him, and said to him, "One thing you lack. Go, sell whatever you have, and give to the poor, and you will have treasure in heaven; and come, follow me, taking up the cross." 22 But his face fell at that saying, and he went away sorrowful, for he was one who had great possessions. 23 Jesus looked around, and said to his disciples, "How difficult it is for those who have riches to enter into the Kingdom of God!" 24 The disciples were amazed at his words. But Jesus answered again, "Children, how hard is it for those who trust in riches to enter into the Kingdom of God! 25 It is easier for a camel to go through a needle’s eye than for a rich man to enter into the Kingdom of God." 26 They were exceedingly astonished, saying to him, "Then who can be saved?" 27 Jesus, looking at them, said, "With men it is impossible, but not with God, for all things are possible with God." 28 Peter began to tell him, "Behold, we have left all, and have followed you." 29 Jesus said, "Most certainly I tell you, there is no one who has left house, or brothers, or sisters, or father, or mother, or wife, or children, or land, for my sake, and for the sake of the Good News, 30 but he will receive one hundred times more now in this time, houses, brothers, sisters, mothers, children, and land, with persecutions; and in the age to come eternal life. 31 But many who are first will be last; and the last first." 12:1 He began to speak to them in parables. "A man planted a vineyard, put a hedge around it, dug a pit for the winepress, built a tower, rented it out to a farmer, and went into another country. 2 When it was time, he sent a servant to the farmer to get from the farmer his share of the fruit of the vineyard. 3 They took him, beat him, and sent him away empty. 4 Again, he sent another servant to them; and they threw stones at him, wounded him in the head, and sent him away shamefully treated. 5 Again he sent another; and they killed him; and many others, beating some, and killing some. 6 Therefore still having one, his beloved son, he sent him last to them, saying, ‘They will respect my son.’ 7 But those farmers said among themselves, ‘This is the heir. Come, let’s kill him, and the inheritance will be ours.’ 8 They took him, killed him, and cast him out of the vineyard. 9 What therefore will the lord of the vineyard do? He will come and destroy the farmers, and will give the vineyard to others. 10 Haven’t you even read this Scripture: ‘The stone which the builders rejected, the same was made the head of the corner. 11 This was from the Lord, it is marvellous in our eyes’?" 12 They tried to seize him, but they feared the multitude; for they perceived that he spoke the parable against them. They left him, and went away. 13 They sent some of the Pharisees and of the Herodians to him, that they might trap him with words. 14 When they had come, they asked him, "Teacher, we know that you are honest, and don’t defer to anyone; for you aren’t partial to anyone, but truly teach the way of God. Is it lawful to pay taxes to Caesar, or not? 15 Shall we give, or shall we not give?" But he, knowing their hypocrisy, said to them, "Why do you test me? Bring me a denarius, that I may see it." 16 They brought it. He said to them, "Whose is this image and inscription?" They said to him, "Caesar’s." 17 Jesus answered them, "Render to Caesar the things that are Caesar’s, and to God the things that are God’s." They marvelled greatly at him. 28 One of the scribes came, and heard them questioning together. Knowing that he had answered them well, asked him, "Which commandment is the greatest of all?" 29 Jesus answered, "The greatest is, ‘Hear, Israel, the Lord our God, the Lord is one: 30 you shall love the Lord your God with all your heart, and with all your soul, and with all your mind, and with all your strength.’ This is the first commandment. 31 The second is like this, ‘You shall love your neighbour as yourself.’ There is no other commandment greater than these." 32 The scribe said to him, "Truly, teacher, you have said well that he is one, and there is none other but he, 33 and to love him with all the heart, and with all the understanding, with all the soul, and with all the strength, and to love his neighbour as himself, is more important than all whole burnt offerings and sacrifices." 34 When Jesus saw that he answered wisely, he said to him, "You are not far from the Kingdom of God." No one dared ask him any question after that. 35 Jesus responded, as he taught in the temple, "How is it that the scribes say that the Christ is the son of David? 36 For David himself said in the Holy Spirit, ‘The Lord said to my Lord, "Sit at my right hand, until I make your enemies the footstool of your feet. "’ 37 Therefore David himself calls him Lord, so how can he be his son?" The common people heard him gladly. 38 In his teaching he said to them, "Beware of the scribes, who like to walk in long robes, and to get greetings in the marketplaces, 39 and the best seats in the synagogues, and the best places at feasts: 40 those who devour widows’ houses, and for a pretence make long prayers. These will receive greater condemnation."